Niall Swann scored Wakehurst's opening goal against Tobermore. Wakehurst manager Ian Gregg believes a lack of self-belief cost his side the chance of a vital victory as they lost 3-2 to Tobermore on Saturday. 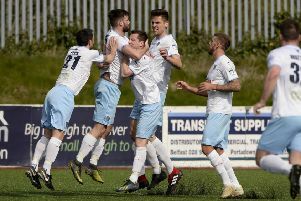 The Ballymena side looked on course for three precious Belfast Telegraph Championship Two points as they raced into a 2-0 lead inside the opening 10 minutes at Mill Meadow. First, teenage defender Niall Swann headed home from a Conor Gregg corner, before Mark Crawford’s pass released Andy Laughlin, who converted from a tight angle. “We also missed two one-on-one chances with the goalkeeper during that early period and we looked as though we were going to be rampant,” Gregg told Times Sport. “But then, rather than carry on in the same vein, we went into our shell. “Whether it’s maybe a lack of self-confidence I can’t say for sure but it almost looked as if the players were thinking ‘we’re two up - we don’t want to blow it from here’. “We seem to be susceptible to that type of situation. We dropped back and looked inhibited in our play rather than pushing on from a good position. “We conceded what I thought was a soft-looking penalty when Ryan Gregg was adjudged to have brought down one of their players as he was coming out of the area, facing away from goal and it was 2-2 at the break. “The winner came about 10 minutes from the end but in truth, we didn’t deserve to get anything out of the game,” said Gregg, who singled out full-back Andy Millar for praise for his performance. “Andy has been very patient. He can play and has played in all the positions across the back four and he has done very well at left-back,” added the manager. Wakehurst: Maybin, Young, Stevenson, Swann, Millar, R Gregg, Lemon, Crawford, O Gregg, Laughlin, C Gregg. Subs: Tolan, Price, Kirkwood, Erwin, Mellon. * Veteran defender Paul Muir has left the club by mutual consent and has signed for Wakehurst’s landlords Moyola Park. * Manager Gregg is looking to add a striker to his panel in the January transfer window, amid continuing concerns over a knee injury to top scorer Conor Gregg. * The club is grateful to an anonymous benefactor who has financed the cost of midfielder George Young’s operation for a cruciate knee ligament injury which has ruled him out for the rest of the season. * Wakehurst have no match this Saturday as scheduled opponents Moyola Park are playing Glenavon in the Irish Cup.